Now that the last of the Christmas decorations are away, and the food is all eaten up, here's a little idea to make sure that the good will of the season isn't forgotten just yet. Ollie got a lovely robust children's camera for his fourth birthday and has been really enjoying snapping away, so when we decided to make thank you cards it seemed an ideal way for him to make use of some of his images. 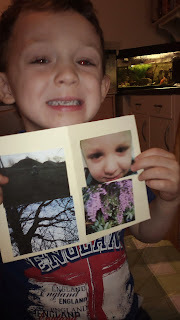 Ollie selected the pictures he wanted to print the night before we made the cards. I then helped him to cut them up with the kids scissors we got him as a stocking gift. 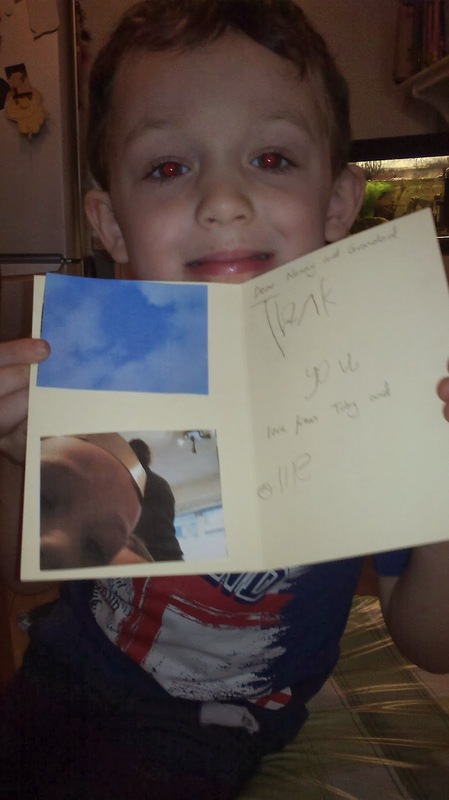 Ollie did the gluing (on to plain cards) and wrote the 'thank you' and his name on the cards. For each card we talked about who it was for, what they had sent him and how much he had enjoyed the gift. Breaking the activity up with other things over the course of the morning meant that he didn't get fed up of writing and he really seemed to get a sense of achievement over each card, running to show them off to Matt. post box. 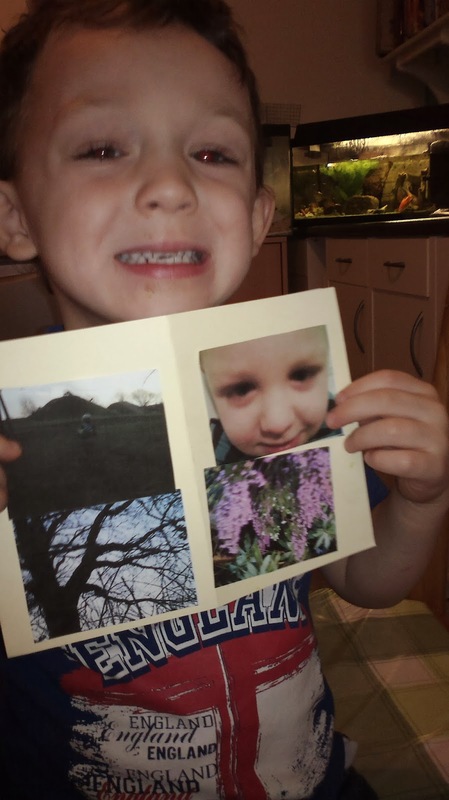 With the photos I made sure I didn't sensor what he wanted to print - there were lots of pictures of his knees and wellies, but I'm really impressed by the ones he picked out himself as his favourites. As with all the activities on here, there's nothing complicated or ground breaking here, but I like the way that there were so many different skills woven into one simple thing. We reinforced the importance of gratitude, the kind that makes your heart sing when you recognise and give thanks for the lovely people and things in your life. We demonstrated that gratitude to the kind family members who gave him wonderful books, games and clothes. We practiced reading and writing. We created something and celebrated the images he had captured. Most of all, we have another way to spend focused time together which is bread and butter to Ollie (while Toby was engaged in the equally important task of teaching Daddy how to build the most awesome train track ever).